Wat Saket ( means "to wash the hair" ) Rajaworamahavihara is just below the Golden Mount. 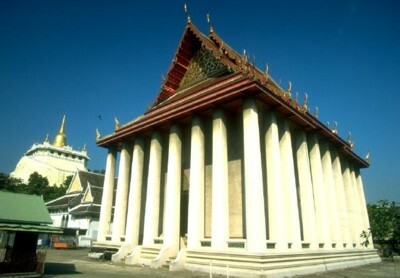 It was build during the reign of Rama I and is still a monastery. In the main building is a large image of Buddha from Ayutthaya. This is a very quiet temple and it‘s architecture and design represent total harmony.